You'll be floored by how easy it is to turn rags into this country charmer! 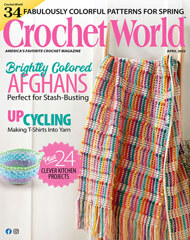 This e-pattern was originally published in the April 2010 issue of Crochet World magazine. Size: 35 1/2" x 25". Made with bed-sheet strips and sizes Q (16mm) and H (5mm) hooks.